Using a sugar coat glass rim is a great way of adding style to your desserts and impressing friends and family. 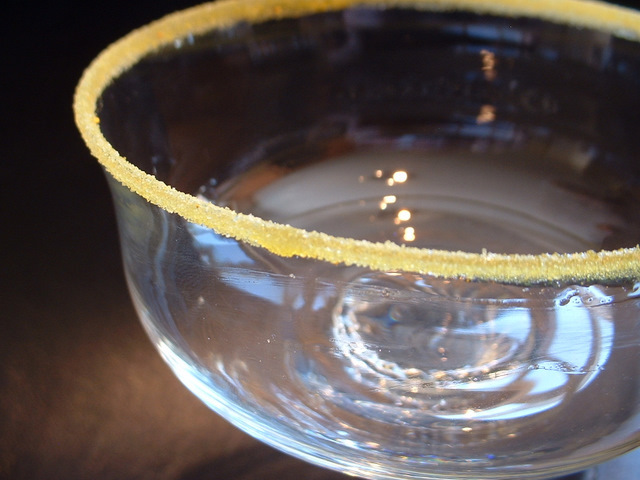 Sugaring the rim of a glass looks great and is really easy to do. Place the sugar into a clean, dry bowl. Add a little of the food colouring and mix well together until the sugar is well coloured. Place the coloured sugar in a shallow dish. Lightly beat the egg white and pour into another shallow dish. Take your glasses and dip the rim into the egg white and then into the coloured sugar. Shake off any excess sugar and you have frosted glass ready to use for your sweets. You can do the same for a savoury dish. Just exchange the coloured sugar for finely chopped parsley, for example.